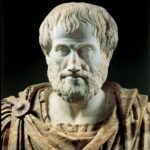 Aristotle was a Greek philosopher, a student of Plato and teacher of Alexander the Great. His writings cover many subjects, including physics, metaphysics, poetry, theater, music, logic, rhetoric, linguistics, politics, government, ethics, biology, and zoology. He is one of the most important founding figures in Western philosophy. Aristotle’s writings were the first to create a comprehensive system of Western philosophy, encompassing morality and aesthetics, logic and science, politics and metaphysics. "For one swallow does not make a summer, nor does one day; and so too one day, or a short time, does not make a man blessed and happy." "It is best to rise from life as from a banquet, neither thirsty nor drunken." "Whether if soul did not exist time would exist or not, is a question that may fairly be asked; for if there cannot be someone to count there cannot be anything that can be counted, so that evidently there cannot be number; for number is either what has been, or what can be, counted." "Whosoever is delighted in solitude is either a wild beast or a god." "A sense is what has the power of receiving into itself the sensible forms of things without the matter, in the way in which a piece of wax takes on the impress of a signet-ring without the iron or gold." "Men create gods after their own image, not only with regard to their form but with regard to their mode of life." "A tyrant must put on the appearance of uncommon devotion to religion. Subjects are less apprehensive of illegal treatment from a ruler whom they consider god-fearing and pious. On the other hand, they do less easily move against him, believing that he has the gods on his side."